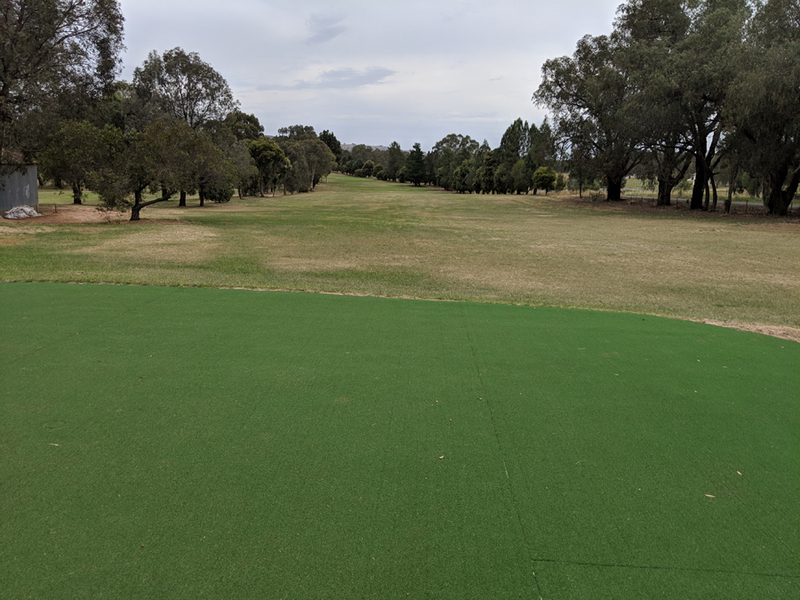 I grew up in regional Australia and I was visiting my home town over Christmas and I took a drive around all the golf courses I had played as a junior and amateur golfer around my home town. 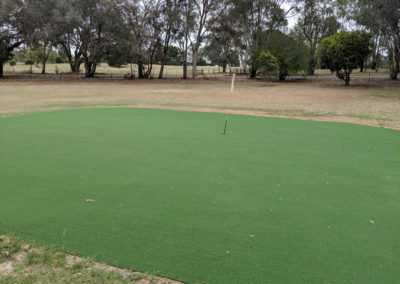 In Australia all little towns seem to have a golf course as part of the sporting facilities of the town. I grew up in a town of around 50,000 people and we had three golf courses in the town itself. There was another golf course in the twin town across the river as well as a number of other courses within 45 minutes’ drive. 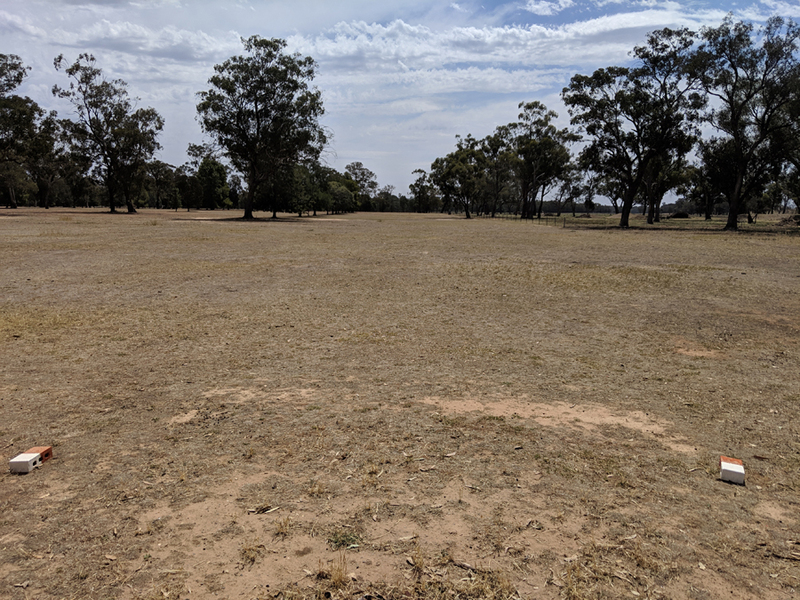 There are also several little sand green courses in the nearby towns which is what this post is about. 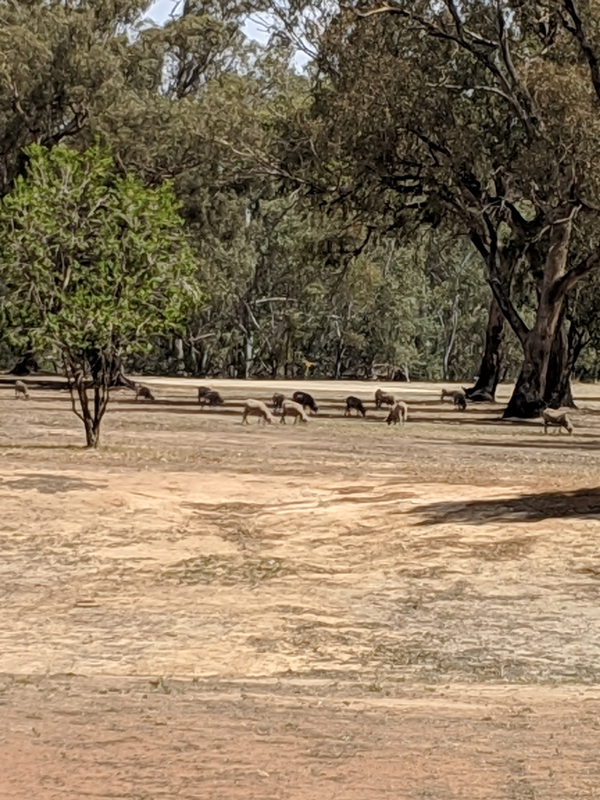 Some of these towns have populations ranging from a few hundred to maybe 1500 and yet they all have a golf course that can be used by the local residents. Now this is where it gets a little interesting! As these towns are very small and there are not many members of the clubs there is not a lot of money to be spent on the courses. There are no course staff to maintain the course and all the work is done by the golfers and volunteers. They are very friendly clubs and when you play golf there you are always guaranteed a fun time with lots of country hospitality. Another little quirk of these courses is the greens. 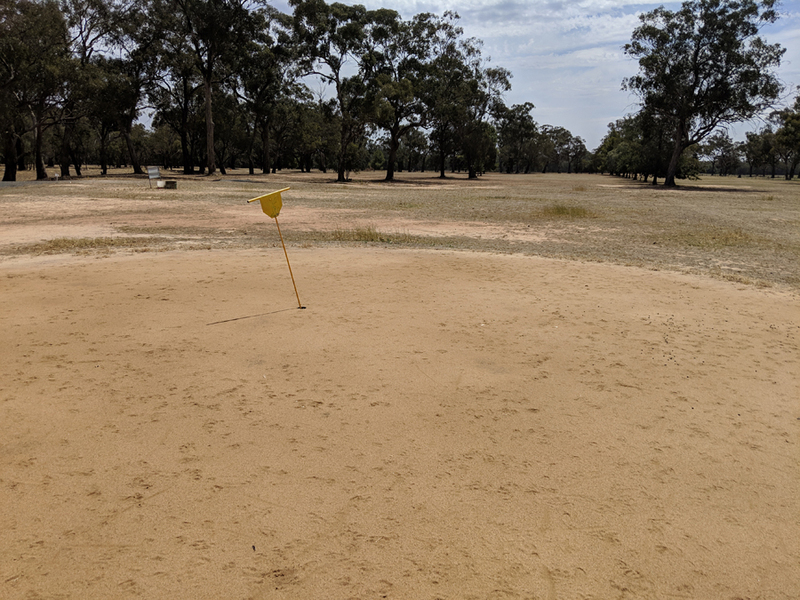 There is no money or staff to maintain grass greens, so these courses have sand greens which are sometimes called sand scrapes. 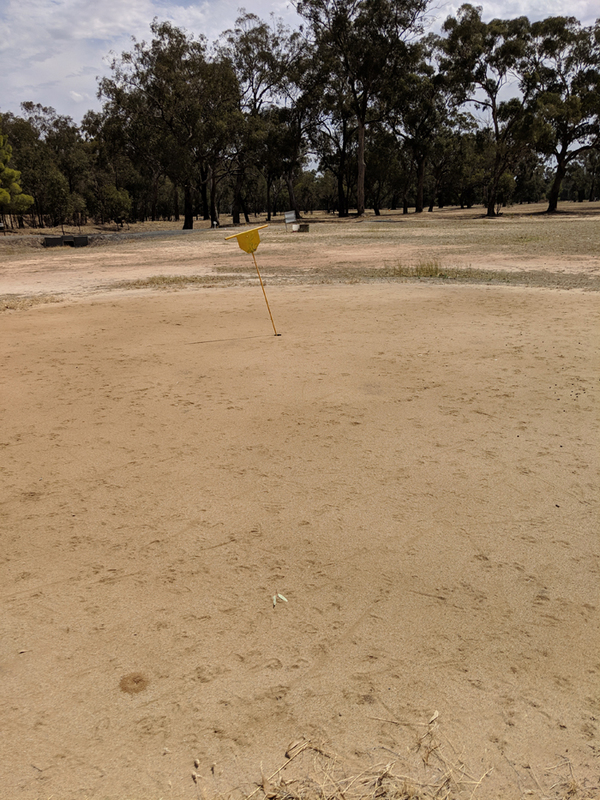 It is a weird feeling to be aiming to hit the ball in the sand for a change! 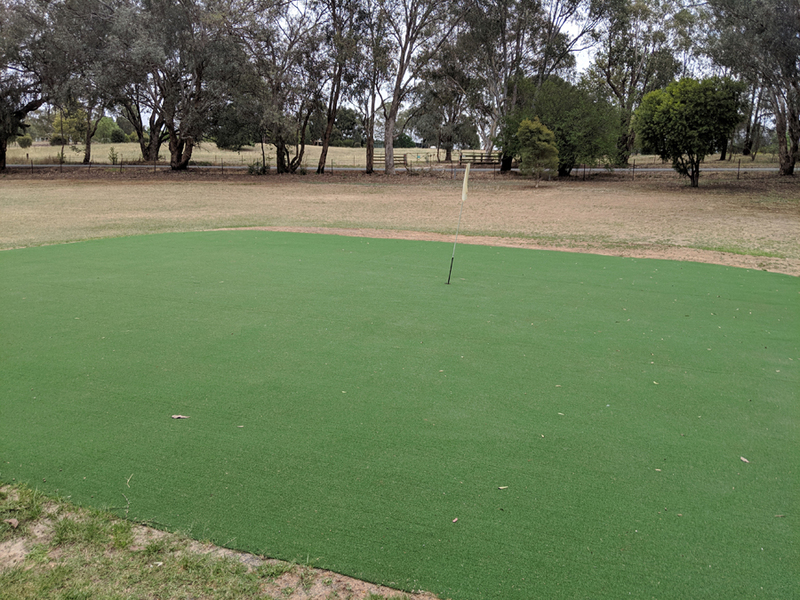 Sand greens are traditionally small and hard so hitting greens in regulations is a challenge. 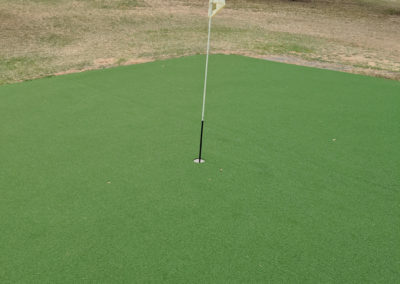 You can’t land the ball on the green surface on the full unless you want to end up 50 yards over the green. You need to hit shots that land short and bounce onto the green. 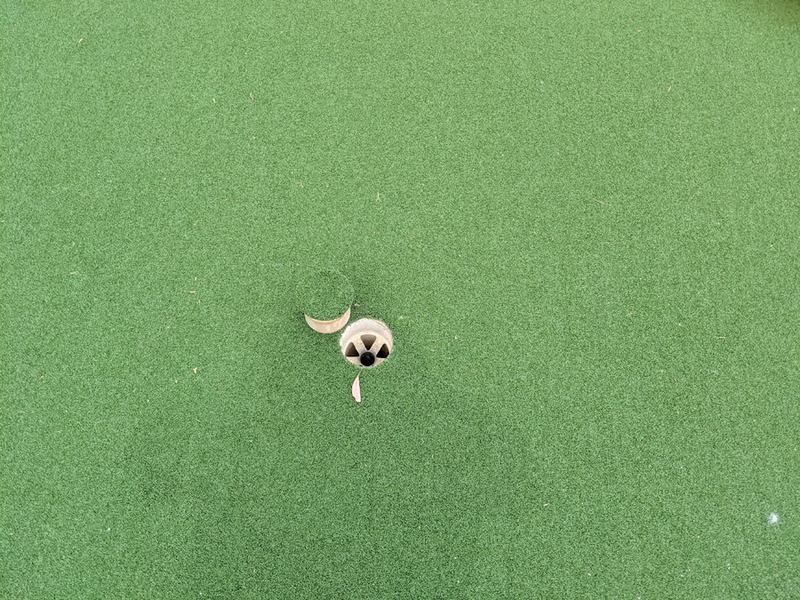 Uneven bounces combined with small putting surfaces makes it hard to have too many birdie putts. Once you manage to get the ball on the green the “scrape” section of sand scrapes come into play. 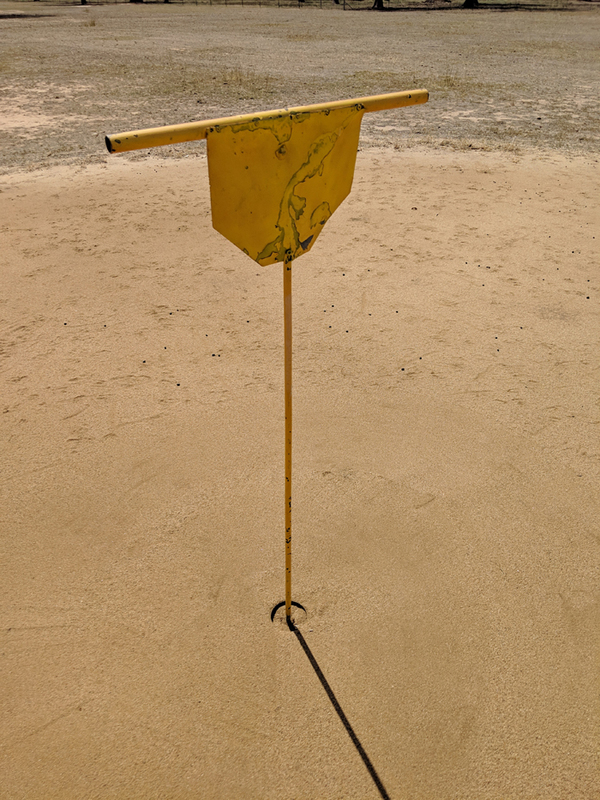 You mark your ball by drawing a line in the sand level with your ball and then use the provided “smoother” to scape a smooth path to the hole from your mark. 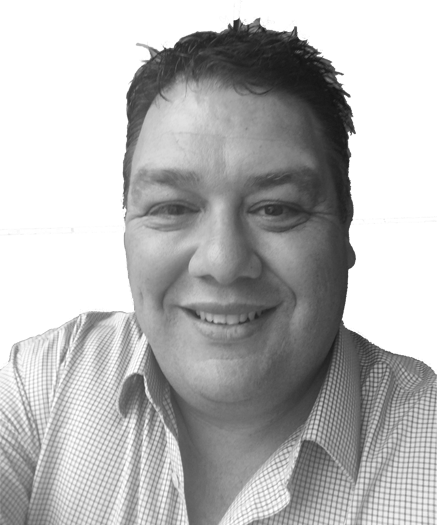 You need to go past the hole and keep an even pressure during your scrape. You are allowed to scrape twice, in opposite directions, on each putt. You then place the ball in the middle of the scraped path in even with your line and putt away. 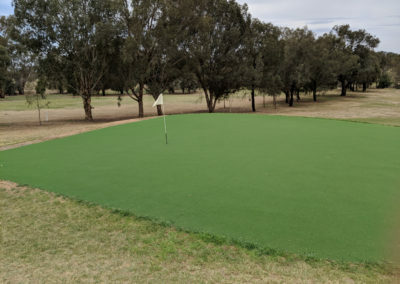 There is usually not too much break on sand greens, and they are normally slower than grass greens so you will see a lot of one putt greens, especially from seasoned sand green players. I can remember losing a tournament to a sand green player who had something like 22 or 23 putts for the 27 holes of the tournament. 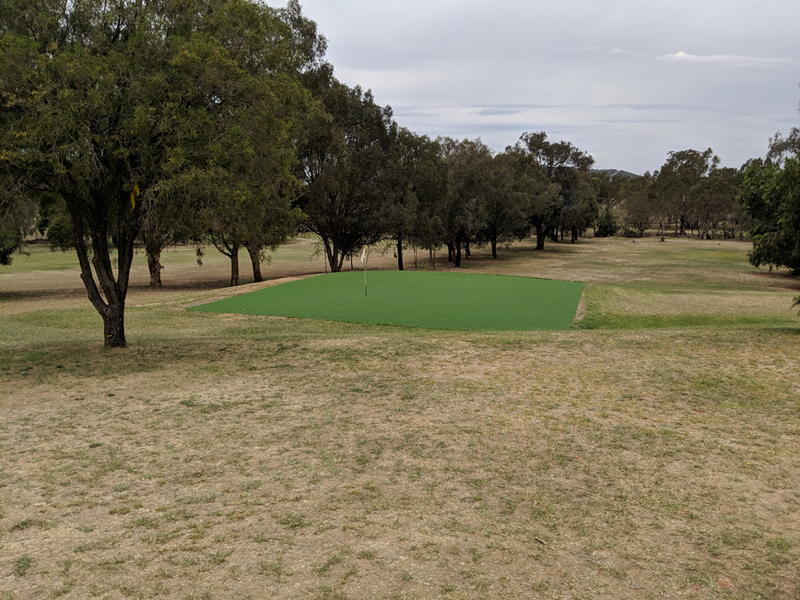 I took these photos that you can see in the post during Summer and these courses obviously don’t have any watering systems. They rely on mother nature to provide rain to green up the fairways, so golf is a Winter sport in these country towns. 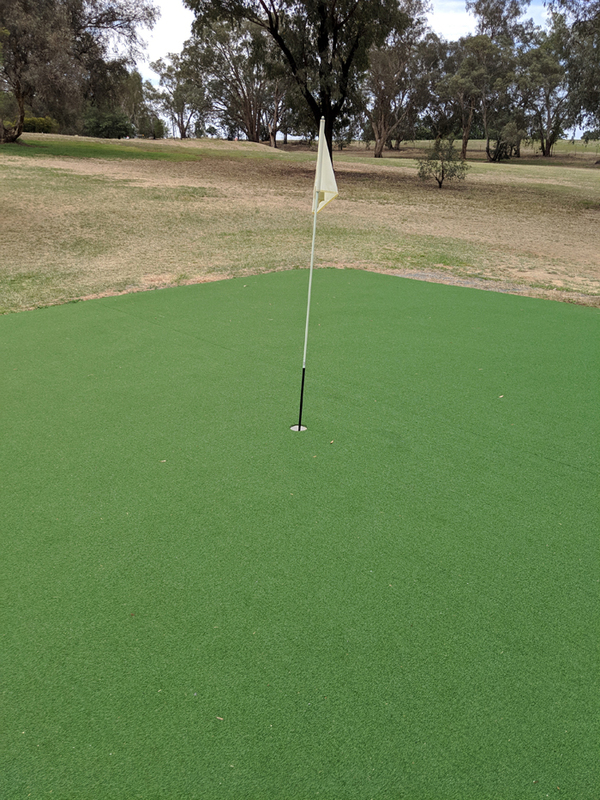 One of courses in the photos has invested in synthetic grass for their greens and this cuts down on maintenance and allows for a couple of pin positions on each green. 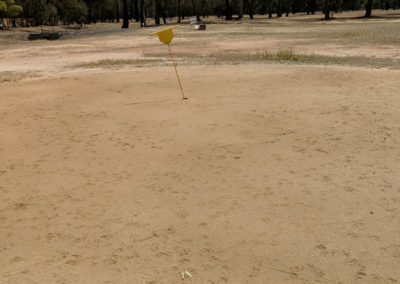 Most sand green courses have the hole in the middle of the green and that is where it stays. 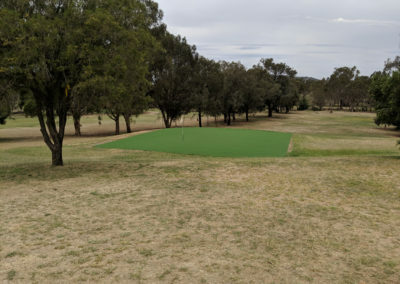 I haven’t played this course since they changed to synthetic, but I am told that they still play a lot like sand greens, so you still need to land the ball short and run it on. 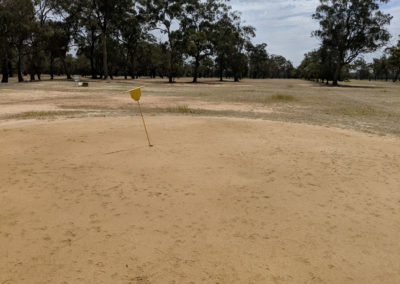 Sand green golf is a lot of fun as you must play different shots and you don’t tend to play too many high wedge shots. You play lots of chip and run shots and you get to be nice and aggressive on your putts as they don’t run too far past generally. 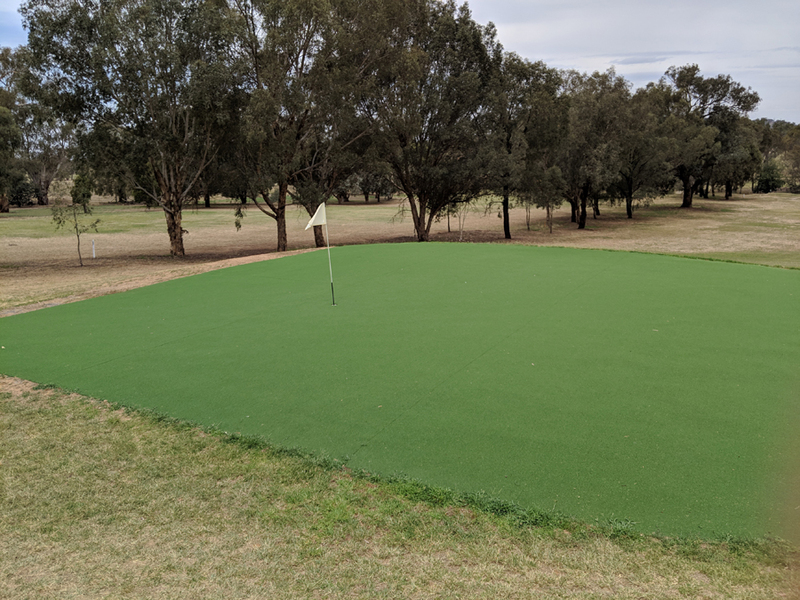 Let me know in the comments if you have any questions about sand green golf and where is the strangest place you have played golf. So where did the Masters theme song come from? That iconic music you hear every year around Masters time. So soothing and peaceful. Makes you think of azaleas, beautiful green grass, perfectly manicured fairways and especially springtime. We did some research into golf’s most famous theme song and below is what we found. The song is called “Augusta” and was written in and recorded by Dave Loggins in 1981. Dave Loggins is the third cousin of Kenny Loggins. We all know Kenny Loggin’s famous song “I’m Alright” the theme song to the most famous golf movie of all time Caddyshack. Dave Loggins was inspired the year before when he attended the Masters and met up with famed CBS Golf Producer Frank Chirkanian who put the instrumental of “Augusta” into the CBS telecast for 1982. And it’s you that I’ll miss when I’m gone. And it’s you that I miss when I’m gone. Loggins’ is now a member of the Nashville Songwriters Hall of Fame. Although “Augusta” is his most famous track that no one knew he wrote, he did have a 1974 Billboard Top 5 hit with “Please Come to Boston”. There you have it, the Masters Theme Song. Want to see some of our other pieces on the history of the game? Check out Backspin. We all love making birdies. Who doesn’t right? But did you know the origin of the term? 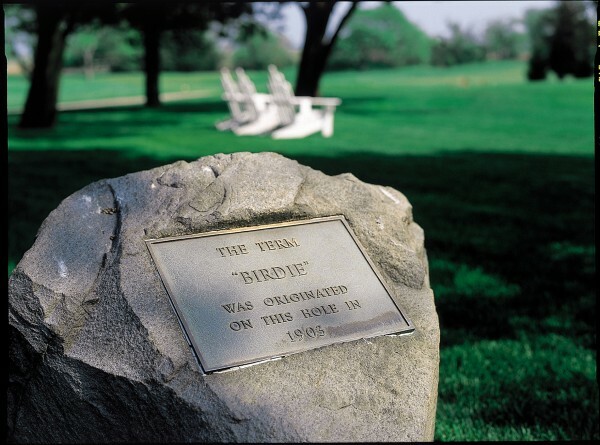 Well, in golf history standards the term birdie isn’t that old at all. Atlantic City Country Club in 1903 and the story goes something like this. Brothers Ab and William P. Smith where playing a round of golf with George A Crump, who later went on to build Pine Valley. 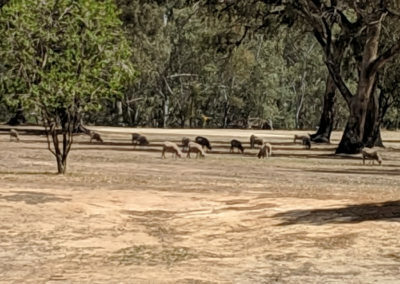 They where playing the par 4 2nd hole at the country club. Ab Smith’s second shot went within inches of the hole and he proclaimed, “That was a bird of a shot.” He proclaimed that with a score of one under par he should be paid double for such a feat. It was agreed upon and from that day forward we call that a “birdie”. To see all the featured articles of Backspin-The History of the Game please click here. Thank you for reading and please leave your comments below. The Masters Green Jacket has been worn by members of Augusta National since 1937. That year the members used the jackets to identify themselves from the crowd to assist patrons of the event. The first Masters Jacket was awarded in 1949 to Sam Snead. The jacket symbolizes membership into the club and has become one of sports most famous awards. The history of the golf tee dates back to the 1500’s. 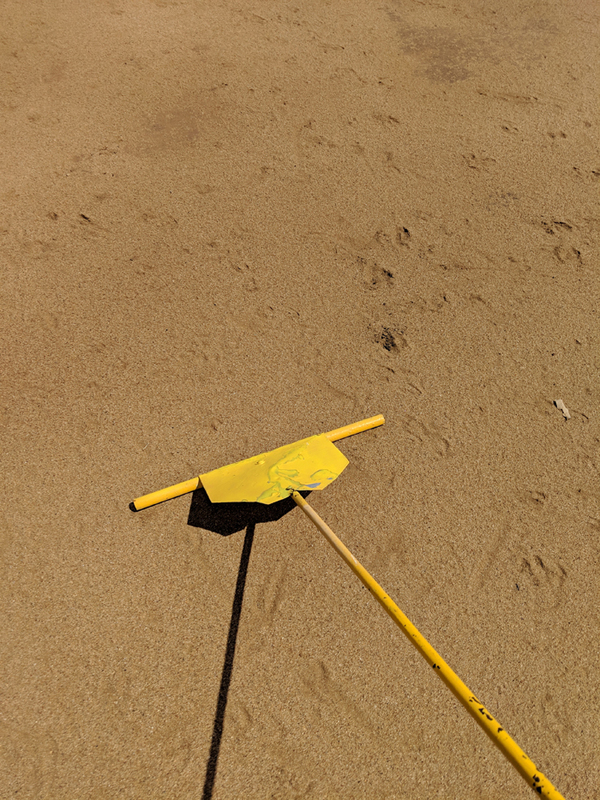 The practice of getting sand wet with a towel and mounding up earth to get the ball off the ground a little went on for some 300 years. The late 1800’s changed all that. This is the history of the golf tee. The original rules of golf from 1744 state that your ball must be “teed” from the ground. Golfers where allowed to go within one club length of the original hole and use elements from the ground to tee it up. 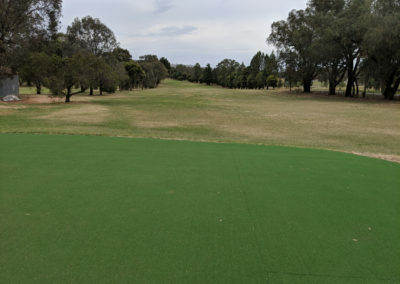 As time went on the game grew and there was a need to separate putting areas from teeing grounds. 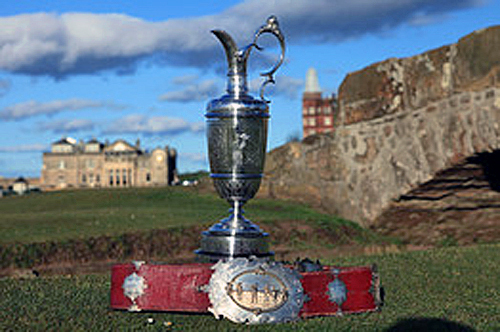 The first course to do this was St. Andrews when Old Tom Morris redesigned the course. You could imagine the mess you had with just creating one tee. The wet towel and dirty hands gave way to the first golf tees. Golfers where in search of reuseable tees. Starting with paper then cork and rubber. The world’s first patented golf tee was invented by two Scots: William Bloxsom and Arthur Douglas. Their patent document is dated 1889 and describes a small rubber plate with a raised ball support in the form of upright prongs or a hollow cylinder. This tee sat up on top of the ground and became cumbersome in windy conditions. There had to be a way to fix it to the ground. 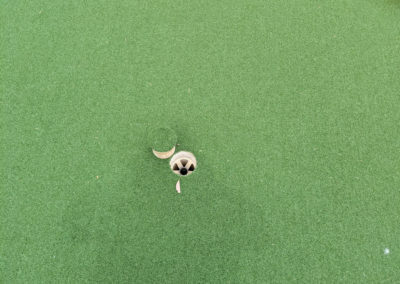 The first invention to stop your ball from rolling away was the “Perfectum” The Perfectum was patented in 1892 by Percy Ellis of Surrey, England. It was made of an iron spike base and round rubber pegs to hold the ball in place. The Perfectum was the first tee to be placed in the ground. 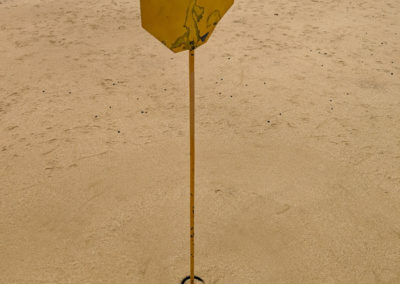 In 1897, Scottish inventor PM Matthews patented a tee called the “Vector” with a metal spike and rubber cup to hold the ball which further held the ball in place. The first really famous patent for a golf tee came from inventor Dr. George Grant. A dentist from the Boston area and one of the first black graduates from Harvard Dental School, Grant invented the first American wooden golf tee. The tee consisted of a wooden peg attached to a rubber tube with a cup on the top to hold the ball. Grant designed the tee to be less rigid at the top and more stable at the bottom. Grant didn’t announce , promote, or sell his work and was unnoticed for a long time. Although not the world’s first golf tee Grant was credited by the USGA in 1991 as the original inventor of the wooden golf tee. The first patented and marketed tee was invented by another dentist named Dr. William Lowell. Dr. Lowell’s patented “Reddy Tee” is the first modern golf tee. 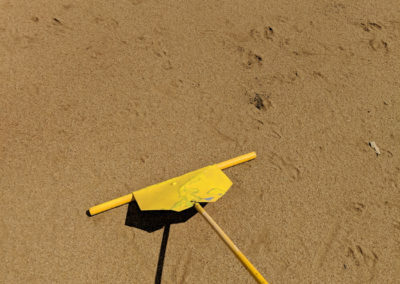 The familliar one piece wooden peg with hollowed out top became the standard even today. Dr. Lowell even had golf great Walter Hagen advertising his invention. Although there where many other golf tee inventions, these are the main ones. Technology has brought golf a long way and the golf tee is no exception. What’s next for the golf tee? It’s all up to the Rules of Golf. The first British Open was contested in 1860 at Prestwick Golf Club and stayed there for some 11 years. Originally the winner of the British Open received something called the “Challenge Belt.” The Challenge Belt was created by the Earl of Eglinton. It was made of rich morocco leather and garnished with a silver buckle and many emblems. The first Challenge Belt was purchased by the Prestwick Golf Club. In the Spring of 1871, Prestwick held a meeting and decided to open the championship to the involvement of other clubs. With no event held that year, the next decisions where made in September of 1872 when it was decided to have Prestwick, the Honourable Company of Edinburgh Golfers and The Royal and Ancient Golf Club team together to find a solution. These 3 clubs joined together to create new awards. The winner of the event would receive the “The Golf Champion Trophy” commonly known today as the Claret Jug. The belt was no more thanks to Tom Morris Jr. In 1920 the three clubs decided to hand over the trophy responsibility to the Royal and Ancient Golf Club. After Bobby Jones’ victory in 1927 came more changes. Prior to that time, winners could take the trophy for themselves. The R & A GC decided to retain the trophy and a replica was made for the winner. Although 4 other replicas were made over the years for display purposes, winners have been getting replicas ever since. That brings us to this year’s British Open to be held at Royal Lytham and St. Annes. The last time the event was held there was in 2001 when David Duval was the victor. For more information on the qualifiers, players and the road leading up to the British Open.